Wow.... stunning technique! I would love to try that out with some of our pictures! We like that. Have a super Saturday. WOW - that is a super cool effect! Coolio! That would make a great Fall greeting card. 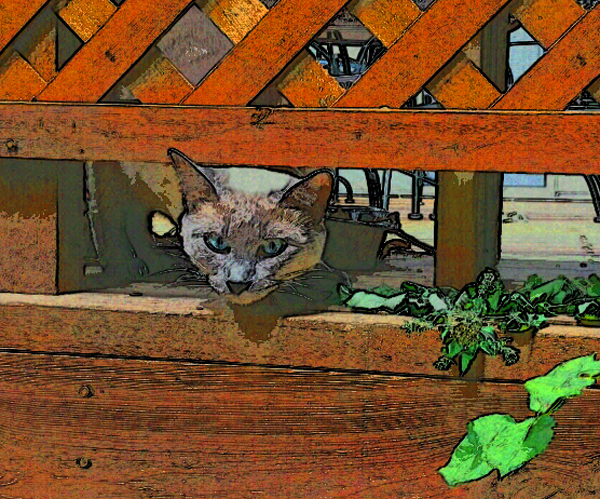 My human has that app too - only she keeps trying to recreate the effects in Photoshop so she can make higher resolution photos! Never satisfied, that is her! *sigh* Humans. WHat can a kitty do? Dood...way cool. Dat all I haf to say...just way cool. "MOM!" *grumble* "...here's anutter ting you don't have...get out da plastic 'cuz I would look so good in paper....."
MOL! Tell Mom it's (whispers) FREE! Mom has an android phone and days you can find the app in the Play store under 'Paper Camera'! Wowwzers! Yous looks bodiless! Like the Cheshire Cat! MOL! That would be far more fitting for Faraday's purrsonality dontcha think? Haaa! It's cool, but you are MUCH better-looking! That knocking-kitty was hilarious! The Human says he'd be a nightmare to live with, but I say everything would be fine if the stoopy Human would just answer the door when he knocked! That's nice. TW's photos are so bad this might help them. MOL! CK, we're not touching that comment wif a 10 foot Wand Toy! Yup, our momma thought so too! Very nice! Teri is gonna go look for that app right now! That's a very nice picture. Purrrrrrrrrrrrrrs.